According to access analysis, I found some users who use stat.ink live in Korea, China, Taiwan and Hong Kong. So I decided to support time zones for them. KST is now alias of Japan Standard Time (JST). Because they are the same since 1988. Please select “en: Japan & Korea Time (ja: 日本時間・韓国時間)” from navbar. Please select “en: China & Taiwan Time (ja: 中国時間・台湾時間)” from navbar. Taiwan Time is now alias of China Standard Time. Please select “en: China & Taiwan Time (ja: 中国時間・台湾時間)” from navbar. Xinjiang Time is a non-official time zone for weastern China. This time zone doesn’t seem to work on the website, but I don’t understand why. Unfortunately, there is no support for display language (yet). I’ll add support those languages if Splatoon 2 is released. I’ve added Gold Dynamo Roller to stat.ink for Splatoon 2. I’ve added the Blackbelly Skatepark to stat.ink for Splatoon 2. It from Japanese name Bバスパーク B basu pāku [en: B(Black) bass park]. The “winning percentage based on K/D” stats page is compatible with Splatoon 2 now. I’ve added detailed stats for each stage to weapon stats. 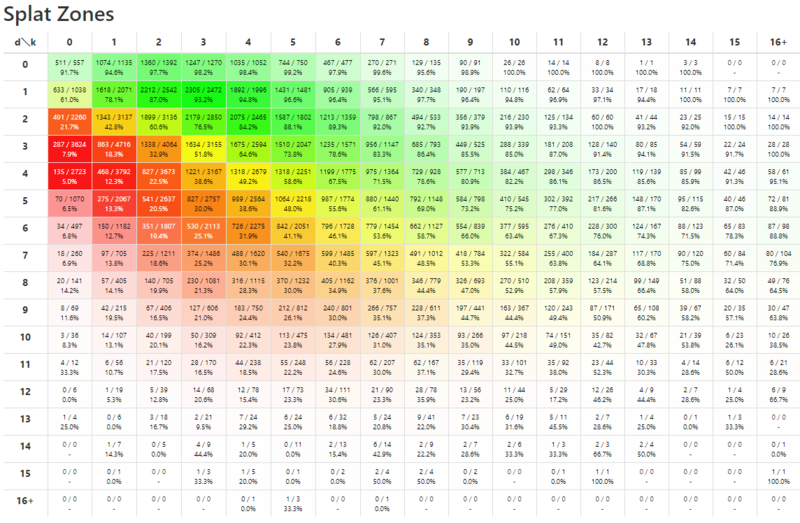 You can check win % and kills/deaths/specials/assist count distributions for each stage. 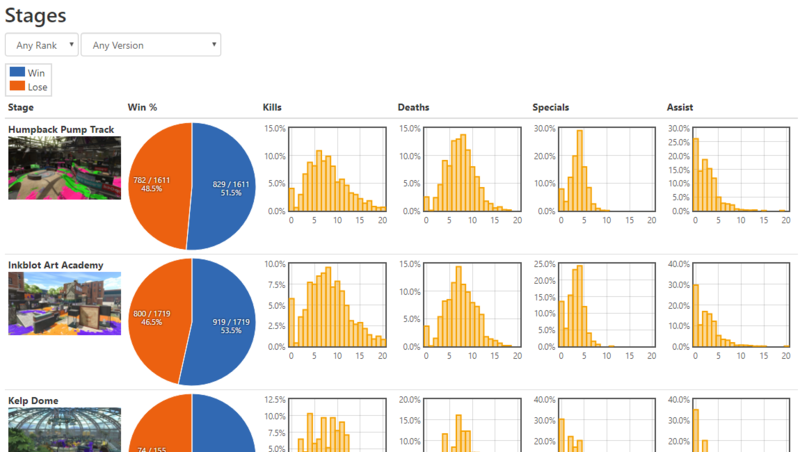 For example, this is a stats page for Tentatek Splattershot/Splat Zones. 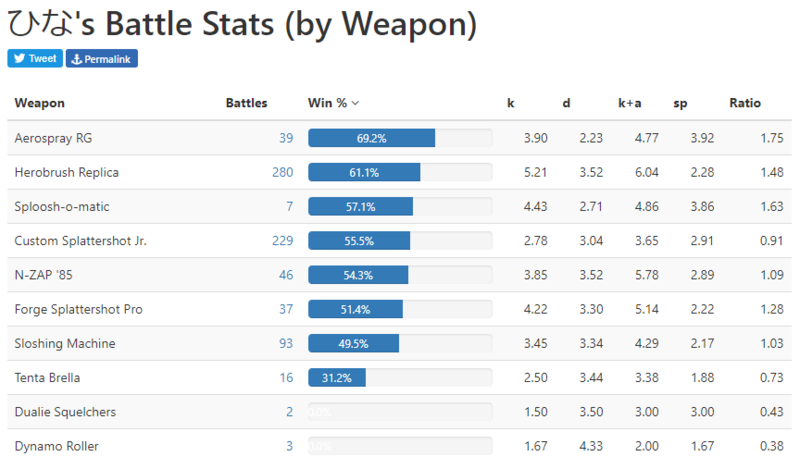 You can view the stats from “Stats: Weapons” on the top page (click weapon’s name on the page). I added the Range Blaster to stat.ink. The “stats by weapon” page was back for Splatoon 2 now! I added Knockout Ratio for Splatoon 2 page. I changed an interface for changing the time zone on the navigation bar. Please select your region before selecting your time zone. Note: Hawaii and Guam are listed in Oceania region. Due to this change, it may be difficult to change on a terminal operated with a touch panel such as a smartphone. I’m planning to update to alleviate it. And I’ll add more time zones such as countries of Latin America. I added new weapons Custom E-Liter 4K and Custom E-Liter 4K Scope to stat.ink.